Apricorn’s Aegis Secure Key brings security to your fingertips. This easy to use and USB flash drive incorporates PIN access with military grade 256-bit AES hardware encryption. With an easy-to-use keypad that is resistant moisture, dust and grit, Secure Key enables you to access the drive with your own unique PIN. There are no software updates or ADMIN rights to contend with, making this drive a breeze to implement in both government and corporate environments. Tested and Validated by the National Institute of Standards and Technology (NIST) Aegis Secure Key is certified to meet the Federal Information Processing Standards (FIPS) 140-2 Level 3 specification. FIPS 140-2 Level 3 validation is the cryptography standard required by the US federal government for protection of sensitive data. It covers 11 areas of its cryptographic security system, including physical security, cryptographic key management and design integrity. Drives Validated to the FIPS 140-2 Level specification are required to be used by U.S. government agencies as well as civilian companies in the US, Canada and the United Kingdom that contract to the US government. 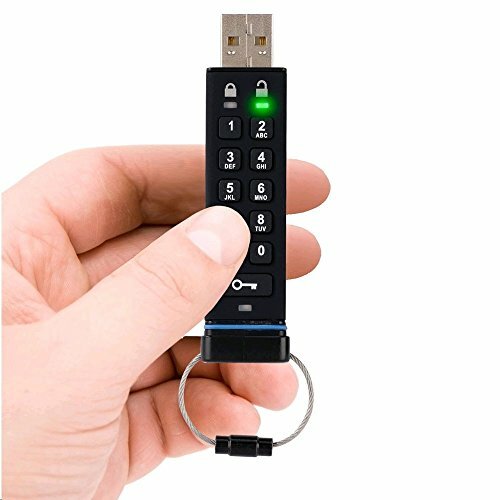 Using a rechargeable battery, the Aegis Secure Key enables the user to unlock the drive with a 7-15 digit PIN before connecting to the USB port on your computer, tablet or mobile device. The embedded keypad prevents hardware and software key logging attempts to hack your password entered via the host system.Secure Key is ready to go right out of the box. It does not require any software or drivers to be installed and is compatible with PCs, MACs, Linux and embedded systems. Secure Key can be configured with independent User and Admin PINs, making it ideal for corporate and government deployment. If the User forgets their PIN, the drive can be unlocked by the Admin PIN which will then clear the old User PIN and allow the User to set a new PIN.Since Secure Key is unlocked using its own keypad and not the PC keyboard, it is not vulnerable to software/hardware based key-loggers or brute force attacks. In addition the Aegis Secure Key further protects your data with a “Brute Force Hack Defense Mechanism”, which deletes the encryption key if the incorrect PIN is entered a total of 10 consecutive times. It does not require any software or drivers to be installed and is compatible with PCs, MACs, Linux and embedded systems. The Aegis Secure Key also includes a drive reset feature which clears both User and Admin PINs, destroys the data, creates a new randomly generated encryption key and allows the drive to be reused. The Aegis Secure Key instantly locks once unplugged from your computers USB port.